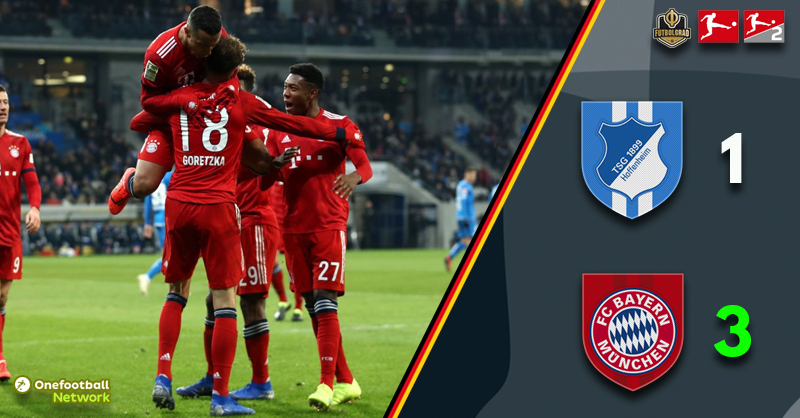 The title race is officially underway as Hoffenheim v Bayern ended with the reigning champions from Munich collecting all three points putting the pressure on Borussia Dortmund. The first chance of the match fell to Hoffenheim. In the 4′ minute, Kerim Demirbay brought in a freekick from the half-field that found Andrej Kramaric wide open but his header was not well placed, and Manuel Neuer was able to collect the ball. Bayern struck back in the 11′ minute with Robert Lewandowski seeing a volley go just wide of the far post. Bayern managed to settle the game at the 15-minute mark and attempted assert pressure on Hoffenheim’s backline. Die Kraichgauer, in the meantime, were looking to win the ball deep and break forward quickly. The Bavarians appeared to have the better in of Hoffenheim in this setup with Thomas Müller just missing the mark in the 19′ minute after a long ball from the half field delivered by David Alaba. In the 28′ minute, Mats Hummels almost walked the ball into the goal after an Alaba corner kick. The defender received the ball inside the box and could not be separated in a scramble until keeper Oliver Baumann finally sat on it. Just one minute later, Leon Goretzka tested Baumann with a shot from inside the box. At this stage, Hoffenheim’s defence was struggling as Bayern carved die Kraichgauer open left, right and centre. The goal finally arrived in the 34′ minute. Kingsley Coman sent a cross to the centre where Lewandowski was given to much room, Baumann stopped his header but then looked poor when Goretzka, who was being left unmarked by Benjamin Hübner, got on the rebound to send the ball across the line. Bayern added a second just before halftime in the 45′ minute. 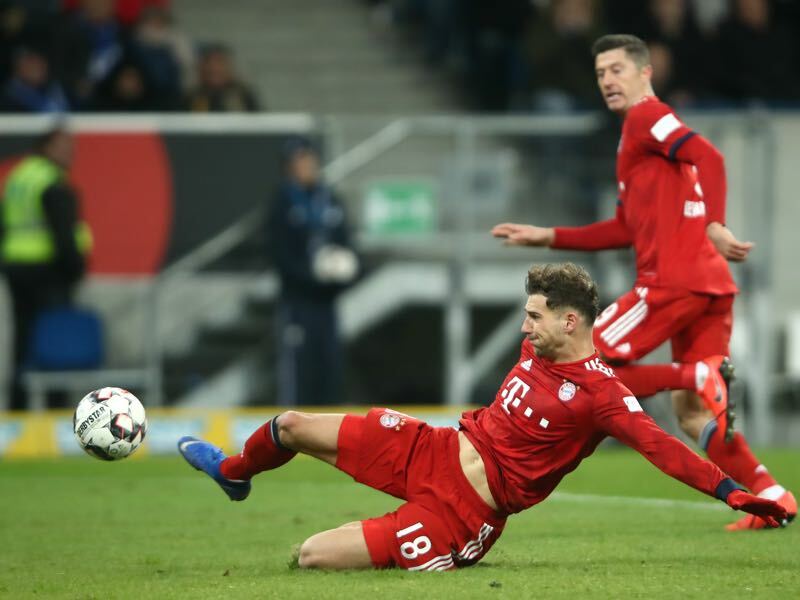 Winning the ball in their own half after a Hoffenheim corner Coman quickly sprinted forward laid the ball off to Alaba, whose cross found Goretzka in the centre and the midfielder dived into the cross to double Bayern’s lead. “In the first half we never gained control, Bayern were the better team,” Andrej Kramarić would later tell the media. The opening minutes of the second half were like a hockey game. Hoffenheim trying to get back into the match went straight on the attack allowing room for Bayern to counter. Both sides produced chances at that stage with Leonardo Bittencourt testing Neuer (47′) and Joelinton and Demirbay failing to get the ball across in back to back attempts (53′). On the other side, Coman tested Baumann (48′), and Javi Martínez had a header go just wide of the goal (49′). At this stage of the game, Bayern seemed vulnerable whenever Hoffenheim stretched the game, and it was no surprise when die Kraichgauer pulled one back. This time the goal arrived after a Bayern corner with Hoffenheim quickly breaking forward and Nico Schulz beating Neuer with a shot from 20-yards out in the 59′ minute. Hoffenheim then tried to disrupt Bayern by playing physical football. In fact, Hoffenheim were asking all the right questions from the Bavarians and appeared dangerous whenever breaking forward. At the same, time, however, Hoffenheim failed to capitalise from their forward runs whenever they did get close to the box. As a result, the minute started to tick away on die Kraichgauer. In the 84′ minute Hoffenheim were on the doorstep. Adam Szalai got on the end of a deep cross inside the six-yard box and appeared to have scored, but Neuer came up with a big stop to clear the ball off the line. Instead, Bayern secured the win in the 87′ minute. James played a fantastic ball from the centre to a wide open Müller on the right; the German international then centred the ball where Lewandowski was left wide open. The Polish striker made no mistake to score Bayern’s third. Leon Goretzka was the man of the match. The midfielder scored the two goals that in the end would secure Bayern’s victory. The former Schalke midfielder, however, was also ever present and with his dynamic runs in midfield he caused all sorts of problems for Hoffenheim’s backline and by completing 89% of his passes was a reliable cog in the Bayern machine. Three big points for Bayern. In fact, the first 45 minutes were a statement of intent by the reigning champions. Bayern were dominant and unplayable at times with Hoffenheim struggling to contain the Bavarians. In some ways, Hoffenheim were lucky to be down by just two and improved immensely in the second half. After their first goal, it looked for a time that they could get back in it with Bayern now struggling whenever stretched. But trying to come back from a two-goal deficit is always hard against Bayern, and in the end, a counter-attack sealed it for Bayern. Javi Martínez celebrates his 100th win in his 120th Bundesliga game, earlier than any other player in the competition’s history. Leon Goretzka managed two goals in one match for the first time in 131 Bundesliga games. Joshua Kimmich made his 150th appearance for Bayern today (in all competitions).